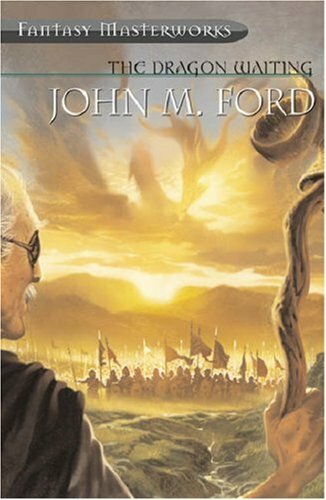 I don’t usually like this type of book, but I thoroughly enjoyed myself while reading The Dragon Waiting by John M. Ford. I don’t read a lot of fantasy. When I do, I prefer quest stories, the kind of thing with lots of action. Characters and setting are also very important, but I find that most fantasy fiction consists of multiple story-lines spent plotting against each other with far more debate and discussion than sword and sorcery. I loved The Hobbit but found The Lord of the Rings far too talky; I love books by Peter S. Beagle but couldn’t make it through George R. Martin. So I ought to have hated The Dragon Waiting, but I didn’t. It’s got multiple story-lines, more debate and discussion than sword and sorcery, even quite a bit of delivering news about events that happened off-stage. But it all worked for me. I think it’s because The Dragon Waiting turns a typical fantasy trope on it’s head. I find that most fantasy novels build a world and then inserts European Medieval social structures into it. Some even bring along a good portion of Medieval European history to act as the basic plot line. This works for many readers, but I’d rather just read history. History is really fun. John M. Ford flips this model. He takes the world of European Medieval society and adds fantastic elements to it. I hope that works as an explanation because it’s the best way I can describe why The Dragon Waiting felt so different from other fantasy epics I’ve tried, and largely failed, to read. So picture England at the time of Richard III. While the English are embroiled in the War of the Roses, the Byzantine Empire, which didn’t fall in the 15th century, is on the move. Meanwhile, instead of plague, a form of vampirism is spreading through Europe, even the two princes in the tower have fallen victim to it. While The Dragon Waiting features many characters from history, the bulk of the story focuses on four companions who travel across Europe from Medici ruled Florence to London working for various politically important people and trying to prevent Byzantium from conquering the continent. It was really fun. I wish there was a sequel. Not a series of ten books, that’s too many, just a sequel. I first ran this review on my old blog, Ready When You Are, C.B., back in 2013. I’ve been slowly migrating all of my old reviews over to this “new” blog. It’s taking years. I like this review because I’m realizing the same thing about myself. I like a lot of science fiction, but only certain fantasies and for many of the reasons you hit on. I got through a couple of the Game of Thrones books on audio but had to stop. Most of the time there is so much time “world building” in these kinds of books that I just don’t care anymore. And yes, ten part “cycles” or whatever they call them are often just too many trips to the well for me. Thanks. Previous Previous post: Tournament of Short Stories, Science Fiction Edition: “Lot” by Ward Moore vs. “Break! Break! Break!” and “Rock Manning Can’t Hear You” by Charlie Jane Anders.